The Leafs opening week schedule felt like a blast from the past, a link back to the old glory days when hockey was truly at its best. No, no, not the Habs game. Screw those guys. I'm talking about the matchups against the Red Wings and Blues. With rare games against both teams in the same week, Leaf fans could be excused for feeling like for a few short days they were back where they belong: in the Norris Division. Ah, the Norris. Perhaps the greatest division in hockey history, at least as long as you don't count meaningless stats like wins. While the rest of the league was busy winning championships, the Norris squads were pounding the crap out of each other for a solid decade. And fans loved it. So before we go back to playing the Northeast division every single game for three months, let's take a moment to look back fondly at those Norris days. Let's tip our caps and bang our sticks on the ice for ten guys who made the division what it was. Let's honor the 10 Greatest Norris Division Tough Guys. For sake of history, the Norris Division technically existed from 1974 to 1993, when Gary Bettman realized that hockey fans really loved the division names and wisely decided to change them to something non-fans in Alabama would like instead. However, everyone knows that the real Norris Division was the 1982-1992 version that features the Leafs, Wings, Hawks, Blue and North Stars. That's the version we're talking about here. Sorry Lightning, you never counted. Tough guys who played in the division outside of those dates aren't eligible, which is why you don't see guys like Tie Domi or Tony Twist. I've also focused on enforcers who were primarily there to fight, which is why you don't see power forwards like the Sutters, Gerard Gallant, and especially Wendel Clark who would have occupied all ten spots of the list if I'd included him and for the record could (and did) punch all the blood out of any guy listed below. Chase had two runs with the Blues, one Norris and one post-Norris. He was a classic Norris enforcer: always willing to drop the gloves to protect a teammate, to avenge a wrong, or just because the game was getting a little bit boring. This old Saskatchewan farm boy was fixture in St. Louis in the early 90s. On a side note, Chase recently made news when he announced that he's been diagnosed with a brain lesion. Get well, Kelly. Peluso's best year as a Norris slugger was 1991-92, when he managed an impressive 408 PIM. Of course, Peluso rarely won his fights, but he makes the list based on sheer volume. The Bomber only played parts of two seasons in the real Norris, although he had a lengthy run in Toronto -- first as the undisputed heavyweight, and later as Tie Domi's wingman. But he makes the list by virtue of being arguably the best technical fighter of his generation -- he was one of the few guys who could switch hands easily, and his ability to hold off an opponent meant he virtually never suffered a clean loss. He was also the first enforcer to intentionally remove his jersey before a fight, making him largely responsible for the league mandating tie-downs. I'll leave it to the reader as to whether that's a plus or a minus. Like Baumgartner, Grimson would be higher on the list if he had played more than two years in the real Norris. Still, he gets in by virtue of his nickname ("The Grim Reaper"), and his general level of insanity. Manson comes close to being disqualified due to an under-rated level of skill. He was a solid defenceman. 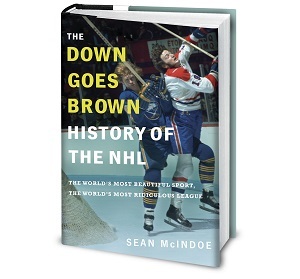 But he was also a scary guy (especially later in his career when his shattered voicebox made him talk like a movie villain) and had a memorable running feud with Scott Stevens. First, the bad news. Kordic was nuts, was a heavy drug-user, and eventually died during a struggle with police. The good news, at least as far as this list goes, is that he was a top-ranked heavyweight who brought desperately needed toughness to the Maple Leafs. Long-time readers already know why Courtnall-for-Kordic was a good trade, but here's the quick summary: at the time, the Leafs were a wimpy team who were getting killed in the Norris, and Kordic changed that in a hurry. Here's the classic Kordic-McRae scrap. God I miss the Norris. Churla was the Stars policeman from the late 80s through the end of the Norris era, before he was tragically murdered by Pavel Bure. Yes, McRae gets a special mention for playing for all five Norris teams at some point in his career. But his best work came with the North Stars from 1987-1992, a string that included three straight years of 350+ PIM. He was never one of the most feared fighters in the league, and was rarely the biggest guy in a fight. But he was the prototypical grizzled veteran who never backed down from a chance to defend a team mate. If you don't respect Basil McRae, you don't like fighting. Kocur is the smallest guy on the list at barely 6'0, but may be the downright nastiest. He wasn't even the toughest guy in his family (that would be cousin Wendel), but he was the toughest guy in just about every fight he ever had. Like Wendel, Kocur didn't have a jab. It was all haymakers, just like starting up the lawn mower in Kelvington, and Kocur sure knew how to land them. We have some fun with Probert around here because of his many losses against Wendel Clark. But if losing to Wendel Clark meant you weren't tough then this list would have zero names on it, and besides Probert at least managed to skate away from all of his Wendel scraps which is more than most guys can say. Beyond that, all you need to know about Probert is that he was so fearsome that when he did lose (Tie Domi, Troy Crowder) it was front page news. And he always took care of business in the rematch. Agree? Disagree? Who did I leave out? Square off in the comments section, but don't forget to wait until a half-second after the puck drop. I miss the Norris division too. Growing up watching the games against Detroit, St. Louis and Chicago I can generate a hate for those teams that I just can manufacture for Ottawa. Don't know that it's enough to crack this list (and he wasn't a pure heavyweight) but Al Secord was all kind of crazy tough when he was with the Hawks. Secord was another guy who I considered. In the end I didn't remember him ever being a goon, more of a power forward. He would have been a nice pick, too, since he had the Hawks and the Leafs on his resume. I'm sorry but I believe that your title should change to Top ten norris division goons or else the list SHOULD include Clark because in my 40 plus years of being a hockey fan(ok Leafs) he was by far the toughest ombre around! Awesome. It makes me laugh when people say (or write) that they used to watch hockey in the 80's and 70's but now it's all goons. I seem to remember bench clearing brawls in the playoffs and every team in the NHL having 1 or 2 guys with 300+ penalty minutes. I can't argue with any choice on the list. You nailed it. My favorite part of the Grimson clip is Dougie's heroic effort in getting in his way. Pure Gutz. In the Manson clip, if you pause it at (3:13 - 3:14) what you see is John Kordic, of all people, pulling Wendel back to the bench, preventing a bench clearing brawl. Makes for an intersting "What if Kordic hadn't been there?" You know a situation has gone out of control when John Kordic is the voice of reason. Shouldn't there be an honourable mention here, in the (mildly amusing)goalie category, for Mark Laforest - for sheer determination and initiative, in honour of his bout with Sean Burke? That was still entertaining hockey, the Wings team looks a LOT different in the last decade, now they win a lot more, but if there's a two or three goal difference in the third period you don't have an epic Probert battle to look forward to.